Before I start anything, I’d like to congratulate all involved in the Curiosity landing. This is a process that goes back years and involves thousands of people, many who will never be known publicly. It’s such a huge achievement and I’m looking forward to the high-quality photos we should receive later in the week. 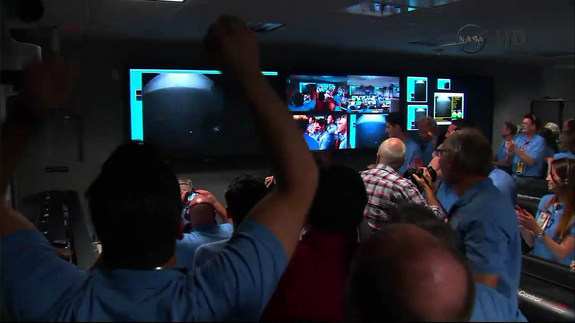 Congratulations to NASA and the Jet Propulsion Laboratory! Now down to business. Ernesto has strengthened a bit since last night. A lot of strengthening occurred early today and winds are up to 65 mph. It looks more like a tropical storm on satellite and is now predicted to reach hurricane strength before it makes landfall somewhere near the Belize-Mexico border. 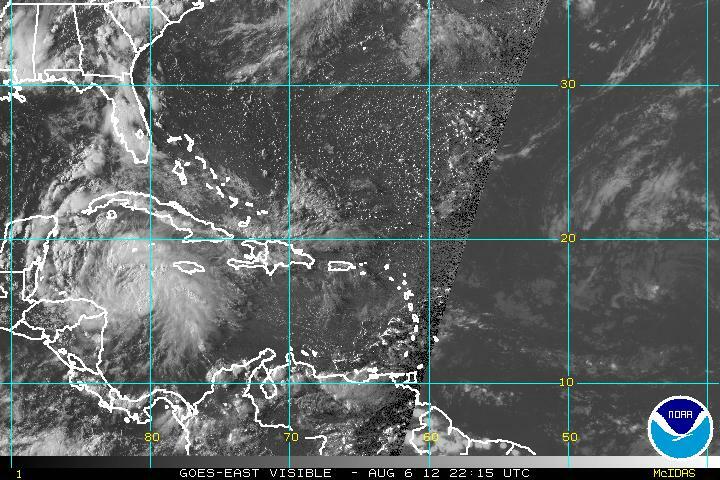 Seen in the bottom left portion of the screen, Tropical Storm Ernesto spins between Jamaica and Honduras. It’s forecast to bring tropical storm conditions to the Honduran coast before making landing over Belize or the Yucatan at hurricane strength early Wednesday morning. I should note that Florence has weakened further and is now just a tropical depression. So why did Ernesto strengthen? Why did Florence weaken? What factors are favorable to tropical cyclogenesis (cyclone formation/strengthening)? This is a topic we could cover for days, but here I will cover four major points. A tropical storm cannot just form at any point in the Atlantic at any time. There’s a reason they form during the northern hemisphere summer and fall and at roughly the same latitude. An area of low pressure is needed for the clouds and thunderstorms to form. In the northern Atlantic Ocean, that low pressure area is usually what is called an African Easterly Wave (AEW). As you may guess, these form over the African continent. I won’t get too technical but the process involves the African Easterly Jet, a jet stream that forms between the Sahara desert and west African monsoons. This is a very technical article, but this is the paper that taught me about AEWs. I shouldn’t have to tell you the Earth is spinning. And while that fact won’t really effect your motion too much on the ground, it has a noticeable effect on something moving through the atmosphere. A rocket, designed to move in a straight, will appear to travel with a curve to onlookers on the ground. This is true with air as well, and in the northern hemisphere that curve is to the right. In a low pressure system air is moving in from all sides. The Coriolis force then deflects them to the right and a center of rotation is created. From there the system can strengthen. Air moves into the low and deflects right. 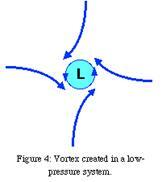 Coming from all sides, the turning air creates a vortex. The apparent strength of the force is stronger the further away from the equator you are. Between latitudes 5 N and 5 S the force is too small and tropical storms do not form. So can a storm cross the equator? Yes in fact, but it would have to be pretty well-developed with a lot of spin to do so. Where do tropical systems get there energy from? The ocean! Water evaporates up into the atmosphere and then condenses, releasing the heat that drives the storm. The warmer the water, the more energy available for the system. 80 degrees Fahrenheit is considered the minimum temperature required for development. Water temperatures in the gulf rise gradually in the northern hemisphere throughout the summer. Thus hurricane formation peaks in August and September. The need for warm ocean water is why storms weaken and die so quickly over land. Here’s today’s ocean temperature map from Weather Underground. We now know that a 1 Celsius increase in water temperature will provide more energy, but why is the weak shear favorable? Shear is a difference in wind speed or direction with distance. When we talk hurricanes, we mean a difference between winds at the surface and winds at the top of the storm. We just mentioned that tropical storms get their heat energy from water vapor condensating into liquid water. When shear is high that condensation is occurring over a different area than where it evaporated. That is, the heat and moisture is being pulled away from the center of the storm, leaving it weaker. An excellent tutorial on wind shear is available here from Weather Underground. It even gets into why hurricanes don’t usually form in the southern Atlantic. So that’s all we’ll cover today. Some major points on tropical storm formation and strengthening. I hope it was informative and useful. One more thing I’ll include is a shout-out to my favorite page during hurricane season. Mike’s Weather Page at spaghettimodels.com is a great site for anyone who loves following the tropics.